The type IV pilus (T4P) is a proteinaceous filament found in many bacteria, playing multiple functions (motility, adhesion, DNA transfer etc…). The T4P is composed of a single, oligomeric protein, the pilin. A complex machinery, embedded in the bacterial membrane(s), drives pilus assembly and retraction. Structural, biochemical and functional studies have provided significant insights into T4P architecture and mechanism. Recently, an appendage termed the Tight Adherence (Tad) pilus has been identified in a number of bacteria, and in particular contributes to virulence in the human pathogen Pseudomonas aeruginosa. 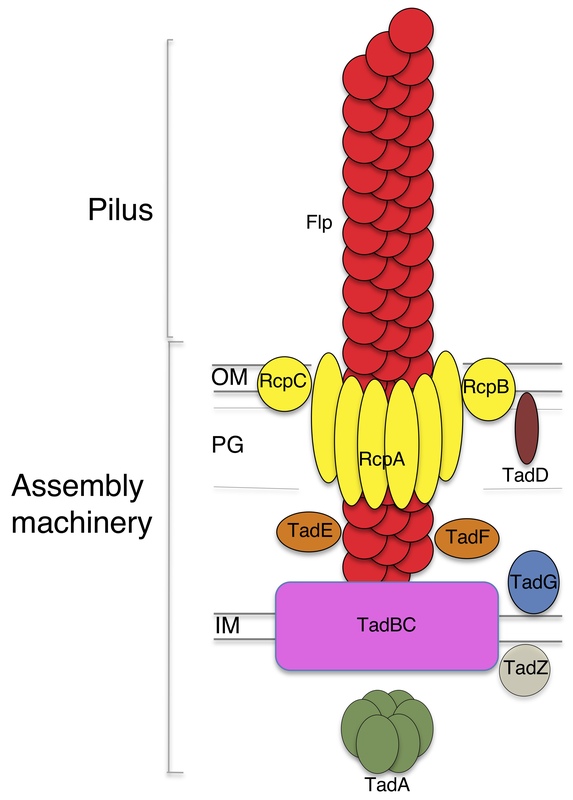 The Tad pilus shares a number of common features with the T4P, including several homologous proteins forming the assembly machinery. However, it also possesses distinctive features, such as a lack of retraction ATPase, and a unique pilin protein. Based in the difference in protein composition and function between the Tad pilus and the T4P, we hypothesize that they are in fact two distinct appendages, evolutionarily related but with a number of distinctive elements. Our aim is to characterize the structure of the Tad pilus and its assembly machinery, to form comparisons with related pili, and will be exploitable for specific inhibitory treatments.